It’s a small thing that more and more hotels are doing. They put up a little sign on your towel rack asking you whether you can use the towel again rather then having to wash them. It’s a classic win – win. It’s obviously very good for the hotel as it saves, time, effort and money. 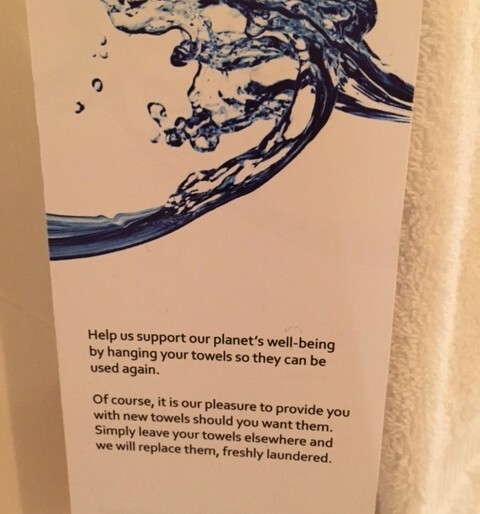 And we as hotel guests feel good about doing our bit for the environment. I love this example because it is simple, easy to do and the cumulative impact is huge. Just think of making this change in every room, in every hotel – around the world and it might make a substantial difference to the environment. How can you apply this example to your brand, team or business?